The Green VAC Facial is a cost-effective solution allowing the practitioner to perform two facial care procedures: vacuum massage (so called radial endodermo therapy) and diamond microdermabrasion. Facial radial endodermo therapy is based on the effects of intermittent vacuum. It significantly increases capillary perme-ability what accelerates the supply of natural nourishing substances, oxygen, oligo-elements, and enzymes. Additionally, it improves the hydration of extracellular matrix what leads to the stimulation of fibroblasts activity followed by the activation of new cell growth. As a consequence, the collagen and elastic fibers are remodeled, and the tone of facial muscles is improved what reduces the appearance of wrinkles and creases. The use of deep tissue vacuum massage is not limited to the facial regions only. The Green VAC Facial has been proven to be an excellent tool for neck rejuvenation as well as for the treatment of upper arms. 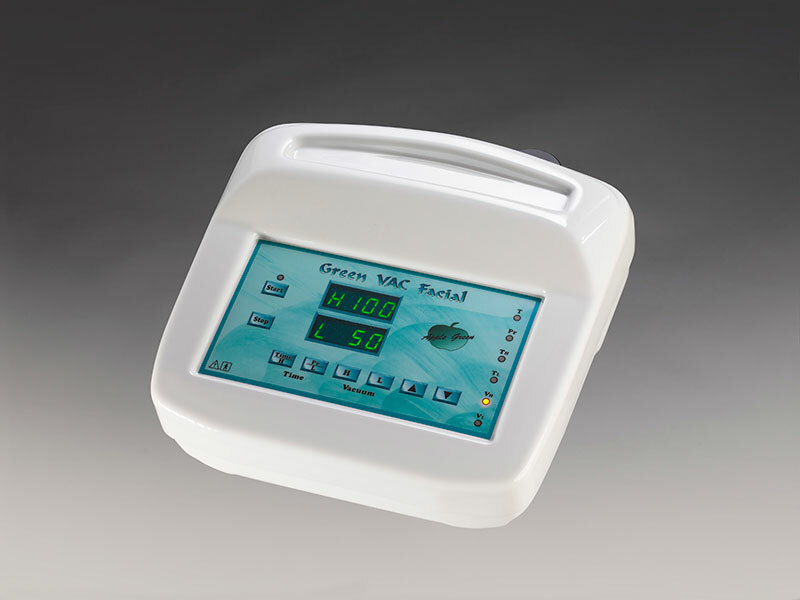 The Green Vac Facial diamond set is therefore a device of choice for treatment of variety of skin imperfections such as sun damage, acne scars, uneven granular skin, enlarged pores, fine lines, wrinkles and mild pigment irregularities. In addition to the face, diamond microdermabrasion can be successfully used on the neck, chest, arms and hands.